The first written records of Christians in France date from the 2nd century when Irenaeus detailed the deaths of ninety-year-old bishop Saint Pothinus of Lugdunum (Lyon) and other martyrs of the 177 AD persecution in Lyon. In 496 Remigius baptized King Clovis I, who therefore converted from paganism to Catholicism. In 800, Pope Leo III crowned Charlemagne Emperor of the Holy Roman Empire, forming the political and religious foundations of Christendom in Europe and establishing in earnest the French government's long historical association with the Catholic Church. The French Revolution (1789–1790) was followed by heavy persecution of the Catholic Church. Laïcité, absolute neutrality of the state with respect to religious doctrine, is nowadays the official policy of the Republic of France. Estimates of the proportion of Catholics range between 41% and 88% of France's population, with the higher figure including lapsed Catholics and "Catholic atheists". The Catholic Church in France is organised into 98 dioceses, which in 2012 were served by 7,000 sub-75 priests. 80 to 90 priests are ordained every year, when the church would need eight times as many to compensate the number of priest deaths. Approximately 45,000 Catholic church buildings and chapels are spread out among 36,500 cities, towns, and villages in France, but a majority are no longer regularly used for mass. Notable churches of France include Notre Dame de Paris, Chartres Cathedral, Reims Cathedral, and Basilique du Sacre-Coeur, Eglise de la Madeleine, and Amiens Cathedral. Its national shrine, Lourdes, is visited by 5 million pilgrims yearly. The capital city, Paris, is a major pilgrimage site for Catholics as well. Some of the most famous French saints include St. Thérèse of Lisieux, St. Irenaeus, St. Jean-Marie Vianney the Curé of Ars, St. Joan of Arc, St. Bernadette, Louis IX of France, St. Vincent de Paul, St. Louise de Marillac, St. Catherine Labouré and St. Bernard of Clairvaux. According to long-standing tradition, Mary, Martha, Lazarus (Marie, Marthe and Lazare in French) and some companions, who were expelled by persecutions from the Holy Land, traversed the Mediterranean in a frail boat with neither rudder nor mast and landed at Saintes-Maries-de-la-Mer near Arles. Provençal tradition names Lazarus as the first bishop of Marseille, while Martha purportedly went on to tame a terrible beast in nearby Tarascon. Pilgrims visited their tombs at the abbey of Vézelay in Burgundy. In the Abbey of the Trinity at Vendôme, a phylactery was said to contain a tear shed by Jesus at the tomb of Lazarus. The cathedral of Autun, not far away, is dedicated to Lazarus as Saint Lazaire. The first written records of Christians in France date from the 2nd century when Irenaeus detailed the deaths of ninety-year-old bishop Pothinus of Lugdunum (Lyon) and other martyrs of the 177 persecution in Lyon. In 496 Remigius baptized Clovis I, who was converted from paganism to Catholicism. Clovis I, considered the founder of France, made himself the ally and protector of the papacy and his predominantly Catholic subjects. On Christmas Day 800, Pope Leo III crowned Charlemagne Emperor of the Holy Roman Empire, forming the political and religious foundations of Christendom and establishing in earnest the French government's longstanding historical association with the Catholic Church. 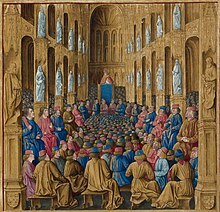 The Council of Clermont, a mixed synod of ecclesiastics and laymen led by Pope Urban II in November 1095 at Clermont-Ferrand triggered the First Crusade. The Kingdom of France and its aristocracy were prominent players in the Crusades in general. Following the Fourth Crusade, a period known as the Frankokratia existed where French Latin Catholics took over parts of the Byzantine Empire. A Crusade also took place on French territory in the County of Toulouse (contemporary Languedoc) with the Albigensian Crusade in the 13th century, called by Pope Innocent III. This played out on local level with fighting between the Catholic White Brotherhood and the Cathar Black Brotherhood. The Cathars lost and were subsequently exterminated. In 1312, the French monarch Philip IV of France was involved in the suppression of the Knights Templar by Pope Clement V; Philip was in deep financial dept to the Templars. The Avignon Papacy was the period from 1309 to 1377 during which seven French popes, resided in Avignon. Prior to the French Revolution, the Catholic Church had been the official state religion of France since the conversion to Christianity of Clovis I, leading to France being called "the eldest daughter of the Church." The King of France was known as "His Most Christian Majesty." Following the Protestant Reformation, France was riven by sectarian conflict as the Huguenots and Catholics strived for supremacy in the Wars of Religion until the 1598 Edict of Nantes established a measure of religious toleration. The French Revolution (also known as the Reign of Terror among Catholics) radically shifted power away from the Catholic Church as Church property was confiscated and the church crop tax and special clergy privileges were eliminated. With the 1790 Civil Constitution of the Clergy, the clergy became employees of the state and the Catholic Church became a subordinate arm of the secular French government. During the Reign of Terror, traditional Christian holidays were abolished and Catholic priests were brutally suppressed, locally through mass imprisonment and executions by drowning. Napoleon Bonaparte negotiated a reconciliation with the Church through the 1801 Concordat, whereby the State would subsidize the Catholic religion (recognized as the one of the majority of the French), as well as Judaism, and the Lutheran and Calvinist branches of Protestantism. After the 1814 Bourbon Restoration, the ultra-royalist government headed by the comte de Villèle voted the 1825 Anti-Sacrilege Act, which condemned by capital punishment any stealing of consecrated Hosts. The law was never applied and it was repealed in the July Monarchy (1830–1848). The 1905 French law on the separation of Church and State removed the privileged status of the state religion (Catholic Church) and of the three other state-recognised religions (Lutheranism, Calvinism, Judaism), but left to them the use without fee of the churches that they used prior to 1905. A notable exception is Alsace-Lorraine, which was at the time of the separation part of Germany, and where the pre-1905 status, including the Concordat, is still in force. This was negotiated in 1918 when Alsace-Lorraine was returned to France at the end of the first World War, and approved by both France and the Holy See with the Briand-Ceretti Agreement. As a consequence, although France is one of the countries in the world where State and Church are most separated, the French Head of State is paradoxically the only temporal power in the world still nominating Catholic bishops, namely the Bishop of Metz and the Archbishop of Strasbourg. They are approved by the Pope and in practice selected by him, but formally nominated by the French President following diplomatic exchanges with the Holy See through the nunciature. During the application of the 1905 law, Emile Combes, a member of the Radical-Socialist Party, tried to strictly enforce some measures which were felt as humiliating or blasphematory by some Catholics, leading to clashes between the Congregationists and the authorities. Anti-clericalism slowly declined among the French left-wing throughout France in the twentieth century, while the question of religion and of freedom of thought seemed to have been resolved. However, it is still present as a defining trait of the left-wing, while most right-wing Frenchmen describe themselves as Catholics (although not necessarily practicing). Thus, the draft laws presented by François Mitterrand's government in the early 1980s, concerning restrictions on the state funding of private (and in majority Catholic) schools, were countered by right-wing demonstrations headed by the then mayor of Paris, the Gaullist Jacques Chirac, who was to be his prime minister in 1986 and would succeed him in 1995 as president. In the same way, the 2004 law on secularity and conspicuous religious symbols in schools, revived the controversy twenty years later, although the dividing lines also passed through each political side due to the complexity of the subject. On this occasion, several Muslim associations have allied themselves with conservative Catholics to reject the law, while one of the consequences of the law was for Muslim college students who refused to remove their veils or "conspicuous religious symbols" to withdraw from the public school system in favour of the private, but publicly subsidized, Catholic schools (where the law does not apply, being restricted to the public education system). In any case, since the 1905 law on the separation of the Church and State, the prevailing public doctrine on religion is laïcité – that is, neutrality of the state with respect to religious doctrine, and separation of the religious and the public spheres, except in Alsace-Lorraine and in some colonies. This state neutrality is conceived as a protection of religious minorities as well as the upholding of freedom of thought, which includes a right to agnosticism and atheism. Although many Catholics were at first opposed to this secular movement, most of them have since changed opinions, finding that this neutrality actually protects their faith from political interference. Only some minority traditionalist Catholic groups, such as the Society of St. Pius X, push for the return to the Ancien Régime or at least pre-separation situation, contending that France has forgotten its divine mission as a Christian country (an argument already upheld by the Ultras presenting the 1825 Anti-Sacrilege Act). France is the location of one of the world's major Catholic pilgrim centres at Lourdes. Growing discontent with respect to the influence of the Catholic Church in education and politics led to a series of reforms during the Third Republic reducing this influence, under the protests of the Ultramontanists who supported the Vatican's influence. Anti-clericalism was popular among Republicans, Radicals and Socialists, in part because the Church had supported the Counterrevolutionaries throughout the 19th century. After the 16 May 1877 crisis and the fall of the Ordre Moral government led by Marshall MacMahon, the Republicans voted Jules Ferry's 1880 laws on free education (1881) and mandatory and laic education (1882), which Catholics felt was a gross violation of their rights. The 1905 French law on the Separation of the Churches and the State established state secularism in France, led to the closing of most Church-run schools. Since the Fifth Republic, most of the participating Catholics in France support Gaullist and Centrist Christian democratic parties. ^ The archbishops of these archdioceses are not metropolitan bishops and thus do not wear the pallium. These are some of the few instances in the Latin Rite church where this phenomenon occurs. ^ This is a territorial prelature, not a diocese. ^ a b c "France". Berkley Center for Religion, Peace, and World Affairs. Archived from the original on 6 February 2011. Retrieved 14 December 2011. See drop-down essay on "Religion and Politics until the French Revolution"
^ "International Religious Freedom Report 2007". Retrieved 2011-02-08. ^ "L'Église face à la pénurie des prêtres". Le Figaro. 28 June 2012. ^ "France". Berkley Center for Religion, Peace, and World Affairs. Archived from the original on 6 February 2011. Retrieved 14 December 2011. 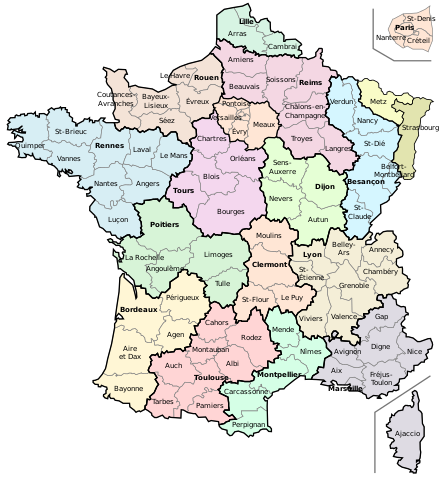 See drop-down essay on "The Third Republic and the 1905 Law of Laïcité"
^ Pope Benedict XVI elevated the Diocese of Lille to a Metropolitan Archdiocese. Cambrai (the former Metropolitan) became its suffragan, while retaining the title "Archdiocese" (see "Daily Bulletin - Elevazione di Lille (Francia) a Chiesa Metropolitana e Nomina del Primo Arcivescovo Metropolita" (in Italian). Holy See Press Office. 29 March 2008. Archived from the original on 7 June 2008. Retrieved 2008-03-30. ).